The cheesecake is the third part of my series on our Mexican themed dinner party, don’t forget to check the first two recipes for Hana’s Nachos Recipe and the Seafood Enchiladas. As I mentioned in the previous posts we prepared these three dishes as part of a Mexican dinner party we threw for a few friends at the beginning of the month. I think I got off lightly when we had the dinner party as Hana made both the Nachos for the starter and the White chocolate cheesecake for dessert! We have both made one or two cheesecakes before, mainly following recipes in our various cookery books. 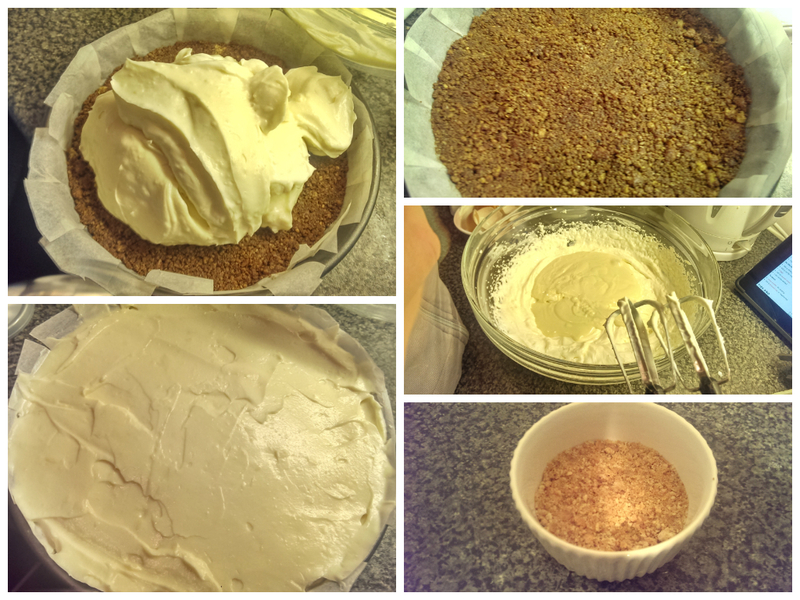 This time around Hana found a great recipe for a White Chocolate Cheesecake by Mary Berry (you can follow the link to it Red Magazine here) and decided use it. I have always loved cheesecake, its been one of my favourite desserts since I was really little. I can remember getting ready made ones in little pots from the supermarket. A lovely crumbly biscuit layer followed by smooth creamy filling and topped with a fruity sauce. I guess compared to a homemade one they probably weren’t nearly as good but I still remember them being great at the time! 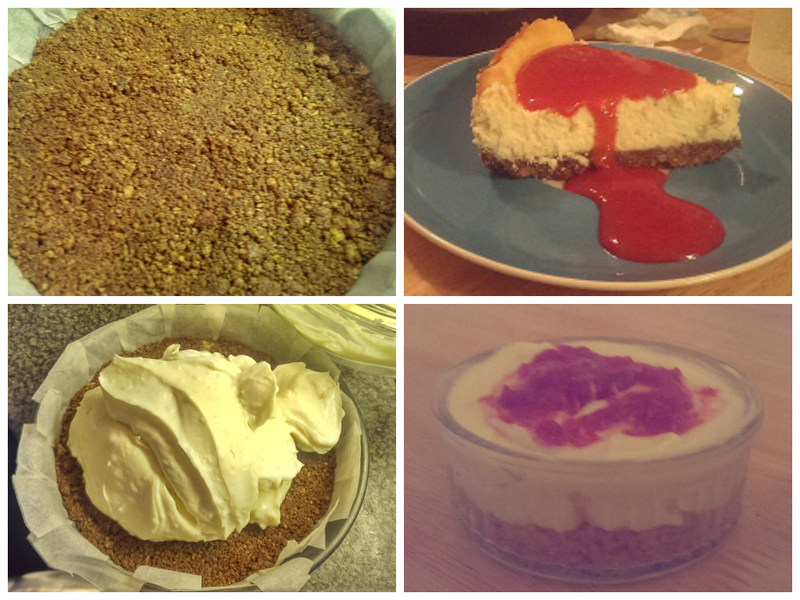 The cheesecake Hana made following Mary Berry’s recipe was hands down the best either of us have ever made. Usually when we make a recipe from a website or a cook book we might change part of it, include an extra one or two ingredients or take something out; this was an already perfect recipe and I’d recommend following this recipe exactly as it is. Do this and you will be sure of a show stopping dessert. As we were going to be quite busy on the day Hana (with a little help from me crushing biscuits, eating spare chocolate and generally getting in the way) baked the cheesecake the evening before. I’d recommend doing this as it gives it time to really set properly. The following week I tried making a white chocolate and raspberry cheesecake the following week and didn’t leave it in the fridge for nearly as long, but more on that later. 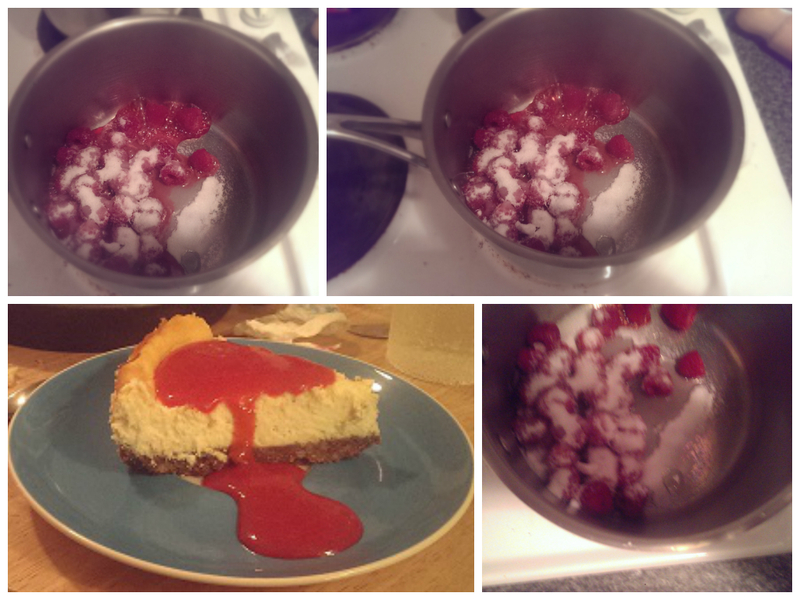 Hana served the cheesecake with a raspberry coulis which she whipped up shortly before serving. A raspberry coulis may sound fancy but it’s dead easy to make and is ready in around 20 minutes, long enough for your guests main course to go down. Place the raspberries to a saucepan over a medium heat. Add half the sugar (you can always add more later). After a couple of minutes the raspberries will start to break down and blend with the sugar. Add a little water at first, the raspberries will release more liquid as they cook down. Being careful take a taste and if necessary add more sugar. Simmer gently for 10 minutes without burning the sugar or fruit. You can add more water as you need it to reach the desired consistency. Once cooked push through a sieve to remove any seeds/ lumps and serve. When I made my cheesecake I tried baking a raspberry ripple white chocolate cheesecake using a similar mix for the raspberries. Essentially I followed the Mary Berry recipe linked above. Whilst I was melting the white chocolate for the filling I also prepared a simple raspberry coulis, following the above recipe. I swirled it into the cheesecake just before popping it in the oven. I think I should have researched and followed a recipe for this as the coulis made it really difficult to see when it was cooked and I did end up over cooking it a bit. The result? A cheesecake which was nice, but nowhere near as good as Hana’s the week before.